As regular readers will know I've been analysing the player data published by the Northern League for quite a while now. At first I looked at the relative popularity of Field of Glory (FOG AM) and DBMM following the demise of DBM. Recently I've been trying to see if there's any evidence in this year's data to support the view that there have been too many drawn games with FOG AM v2. I now have data from 4 of the 5 rounds to be held this year and was trying to see if there were any early indications of trends when I stumbled across an interesting preliminary correlation. If all games were drawn and unfinished the average combined score for the two games played in each round would be 20. If all were outright victories it would be at least 25. Games are scored out of 20 with a bonus of 5 for a win and further bonuses based on the class system used in the League. It's tempting to conclude that in 2013 the decline in numbers playing FOG AM v2 has left a core of players of roughly similar ability (and armies?). 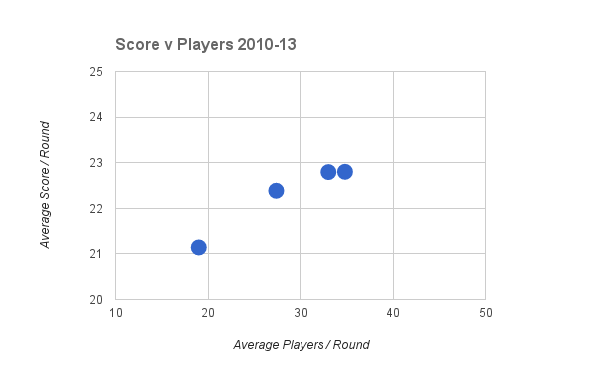 This in turn has resulted in a corresponding drop in the average score per round due to more unfinished (drawn) games. As expected the plot shows far greater variation but the correlation is still apparent. At first glance I would say this plot is curved and far less linear than the plot using the averages. This is because the combined average score is constrained: it cannot fall below 20 and is very, very unlikely to be more than 25. I'd like to have drawn a best fit curve on this plot but it does not seem possible with gDocs. 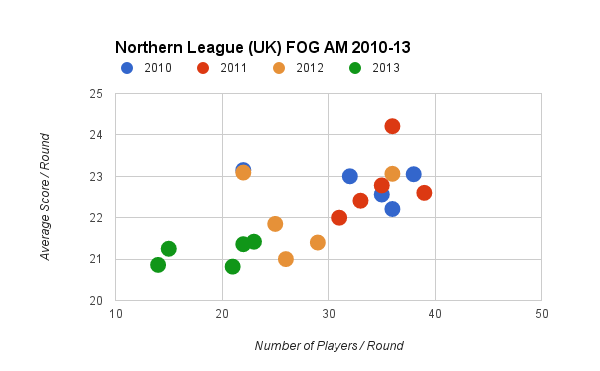 Once the data for the final round is available in late November, the plots will automatically update (thanks to the magic of gDocs) but I don't expect this to change the conclusion that FOG AM in the Northern League has shrunk to a core group who are of similar ability and as a result are more likely to draw their games. I doubt that the actually playing FOG AM v2 has had a direct influence on this trend as the same trend is present in the FOG AM v1 data alone. Where I do think it has played a part is in reducing the pool of active players in the Northern League not least because the rules have very limited retail distribution and are quite expensive. Finally, elsewhere people have reported a steep drop in the number of FOG AM players attending "Slitherine registered competitions" whatever they are. Taken globally their data suggests a 33% decline in players per tournament and a 59% drop in the of number of tournaments. The UK trend in this data is close to the global trend and at first glance the 2013 data for the Northern League seems to support this but I'll deal with this in more detail later when I review the 2013 data in full. Very interesting post. I don't about the UK, but in France, it'strue. Many players have left fog for another set of rules, which has now a very active community, and lots of tournaments. Whereas fog is in full decline. Well, we're all still waiting for the English version Seb...! Data for 2010 amended slightly after checking spreadsheet showed a small amount of data was omitted from the averaging calculations. The conclusions are unaffected. It's not a statistically valid sample but locally, our FoG group has moved on to Maurice and Saga. We can't get them to turn out for FoG and we all bought the v2 rules. Meanwhile, all of my ancient armies sit. Sigh. I'm not sure even my sample is really statistically significant; compelling but not statistical proof. If it's any consolation my medieval armies have been unused for most of 2013 and most likely for 2014. I feel you pain.